The newly-leaked set pictures give the first full look at Brendan Fraser’s character on the upcoming DC Universe series. New photos from the set of upcoming DC series “Doom Patrol” have landed online. Taken during the filming in Atlanta, Ga. on Thursday, September 13, the pictures give the first full look at Brendan Fraser‘s Robotman. During the shooting, actor Riley Shanahan was behind the Robotman mask. The cast and the crew were filming a scene in which the cyborg superhero appears to come to a boy’s rescue. Wearing a leather jacket and dirty jeans, the actor put a protective arm around the boy. Fraser himself was not spotted on the set that day as he would only provide the vocal performance of the character and appeared in flashback scenes as Robotman’s human alter ego Clifford Steele. 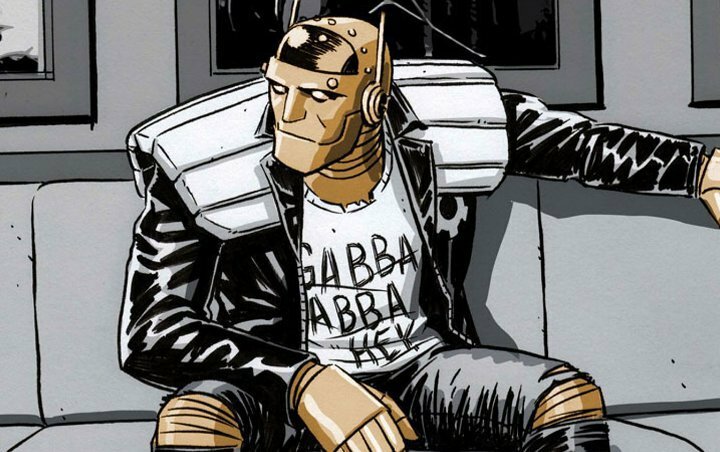 Written by Jeremy Carver, “Doom Patrol” is a reimagining of one of DC’s strangest group of outcasts, Robotman, Negative Man, Elasti-Woman (April Bowlby) and Crazy Jane (Diane Guerrero). Led by the mysterious Dr. Caulder (Timothy Dalton), they’re called into action by the ultimate hero for the digital age, Cyborg (Joivan Wade). Banding together, these rejects find themselves on a mission that will take them to the weirdest and most unexpected corners of the DC universe. Clifford Steele is depicted as a former race driver who was involved in a horrific accident that left his body uninhabitable. Cliff’s brain was saved by the mysterious Dr. Niles Caulder and he lives on in a powerful robotic body. “Doom Patrol” series is set to debut on the upcoming DC Universe streaming service in 2019. Carver also serves as executive producer along with Geoff Johns, Greg Berlanti and Berlanti Prods’ Sarah Schechter. Berlanti Productions produces in association with Warner Bros Television.